Wow… it’s been an amazing week. 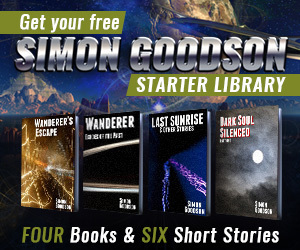 Last Monday Bookbub ran a promotion for Wanderer’s Escape. For those who don’t know, Bookbub is the largest site offering notifications for free and discounted books with almost half a million subscribers to sci-fi alerts alone. Due to huge levels of demand from authors, getting a book accepted is no mean feat and is something I’d been trying for a while. Once they accepted Wanderer’s Escape I knew I’d see a boost in downloads, and I was secretly hoping to reach the upper realms of 18,000 downloads though I’d have been more than happy with the average of 12,000 or even with just 8,000 or so. To say that I’m stunned would be a huge understatement. To say I’m lost for words… probably isn’t something an author should admit to. So all I can say is I’m over the moon, and the red wine we’re toasting the success with is… well, pretty rough actually. But it’s doing the job. I’ve just finished the last book in the Wander series. Have enjoyed all three in this series – but time the bring it to a close. When can we expect to see the next book? How can I get involved in the Beta reading program? Thanks for the feedback. I’m about 45,000 words into the next book and at the moment. I’ve got the story arc worked out roughly though there’s loads of detail to come, and I’m not sure whether there will be just one or two more books to finish off the series. If it’s two I’m not going to leave it on such a cliffhanger. That free download lead me to purchase the other 2 books. Tainted Universe *REALLY* left me hanging. It has been amazing – 3,500 sales now in just 23 days, and loads of really useful reviews – even those where people haven’t liked the book(s) have had useful insights in them. BookBub is my only (I’ve tried many) Kindle recommendation source – it’s where I discover new favorite authors and it was where I found Wanderer’s Escape. I downloaded Escape in June, but it somehow got pushed down the list and I didn’t read it until last week—my loss. Since then I’ve purchased and finished Echoes of the Past, and I purchased and started Tainted Universe last night. Thanks for persevering with becoming accepted on BookBub and thanks for writing such an enjoyable series. Thanks for that – it’s always interesting to know what is and isn’t working advertising wise. There’s no doubt that bookbub is head and shoulders ahead of all the others right now, but there are a couple that I also use (as a reader) – book sends and the fussy librarian, which gives me a few more books to choose from. Both are also genre specific which is a huge plus to me.